Oh my goodness, I can’t believe I haven’t updated you on The Great Valentine’s Day Chili Cook-off of 2012! You will remember (or probably not) that I mentioned back on Feb. 13 that Andy and I were competing against each other in a Valentine’s Day chili cook-off at work. It was the Battle of Meat vs. Veggies. For both of us it was our first time entering our office’s chili cook-off, which happens about twice a year. We even went out and bought a crock pot just so we could battle each other (and borrowed Andy’s mom’s for a second one – so thank you!). Andy feels very strongly that chili should not have beans. He says this is how it’s done in Texas. Andy is not from Texas. I just want to point that out. 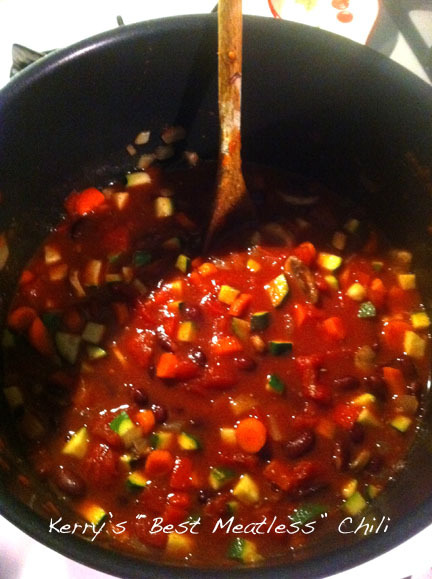 I, on the other hand, don’t eat meat, so my chili is pretty much all beans, carrots, peppers, zucchini… All the good stuff. Oh, this was going to be a good cook-off! Who would win?! 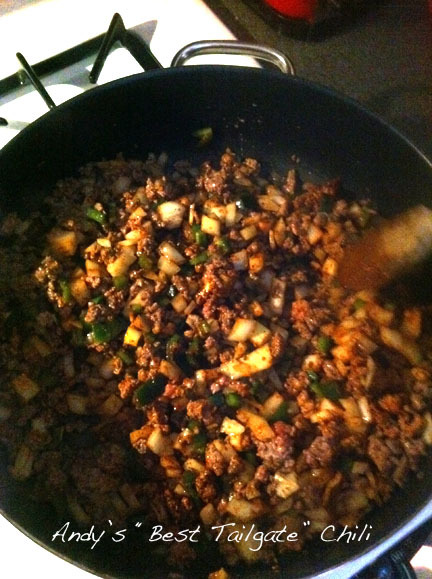 The morning of the cook off, I decided to heat up my chili just a little bit to cook out a some excess liquid. So I had it on the stove on low and went to check on it, and the whole thing was a dried up, burned up DISASTER. I felt like the biggest idiot. I was so mad at myself. Here I’d spent hours making this chili and spent quite a bit of money on it (making chili isn’t cheap, especially when you insist on getting all the ingredients at Whole Foods), and then I had to go and ruin it. Do you ever do really stupid things and then just hate yourself after and decide you’re just plain the dumbest person who’s ever walked the earth? Yeah, I do that. I cried my eyes out because I felt horrible and texted Andy to tell him how dumb I was. He suggested I add water to it, which of course I hadn’t thought of because I was too busy feeling stupid, and it totally, mostly worked. I still think the chili had a little bit of a burned taste, but I entered it in the contest anyway. Well, honestly, everyone got an award. Because it was just that kind of thing. They usually come up with really dumb awards just so everyone gets something. Andy’s award was for “Best Tailgate Chili,” and I got “Best Meatless Chili.” (The fact that I was the only vegetarian entry is completely beside the point.) But whatever, I think we did awesome. Both of our crock pots were completely empty after everyone had a chance to taste them, which means they must have been pretty good. And at least I didn’t win “Most Well Done.” Seriously.